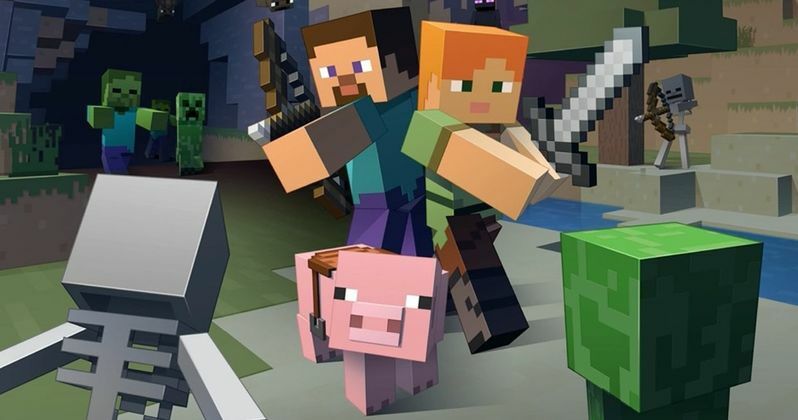 Warner Bros.' big screen adaptation of the Minecraft franchise has just been delayed after director and co-writer Rob McElhenney dropped out of the project. The film will no longer be released in May of 2019 as Aaron and Adam Nee have been hired by the studio to write a new script. The Nee Brothers were also recently hired by Sony to helm their long-gestating Masters of the Universe movie, so this news could end up effecting both projects in the end. It isn't clear if the Nee Brothers will start the script before or after completion of Masters of the Universe. Rob McElhenney was recently asked about the status of the Minecraft movie and he said, "No, that is not happening." The It's Always Sunny in Philadelphia creator and star did not elaborate as to why he is not involved in the project any longer. Jason Fuchs wrote the previous draft of the screenplay with McElhenney, which will now be handled by Aaron and Adam Nee. As for when the movie will finally see the light of day, that is unknown at this point in time. Warner Bros. first announced the Minecraft movie back in 2014 and revealed that it would be a live-action film based off of the mega-popular video game franchise. Shawn Levy was previously attached to helm the project, but it was later revealed that Rob McElhenney was taking over. Throughout the years there have not been very many updates and it was last reported that Steve Carell was in talks to star in the film, but that was towards the end of 2016. Roy Lee (The Lego Movie) and Jill Messick are still producing, which should give hope to fans who have been anxiously waiting the Minecraft movie. Back when it was announced that a LEGO movie was in development, critics thought that the movie was doomed. Hardly anybody believed that a LEGO movie would be able to come up with any box office success. However, those critics were all proven to be very wrong, so it might end up taking a little longer to get Minecraft right, which could be a good thing in the long run for the project. While this is all pretty good news for Minecraft, it has certainly brought some questions about the Masters of the Universe movie that the Nee Brothers were recently hired to direct. If it is later revealed that the directing duo have left the He-Man film, it could spell disaster for the project. Hopefully, some more news about Masters of the Universe and the release date of Minecraft are announced in the coming days. While May 19th is still pretty far out, a 2020 release date seems more feasible for the time being, or at least until we hear any official world from the studio. You can read more about Rob McElhenney stepping down from the Minecraft movie over at The Wrap.